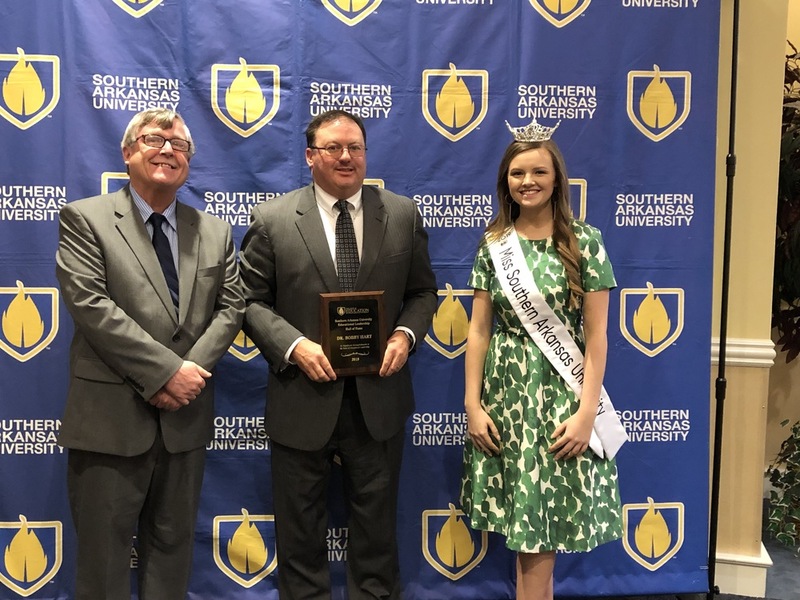 MAGNOLIA – Hope Public Schools Superintendent Dr. Bobby Hart was inducted into the 2019 class of the Southern Arkansas University Educational Leadership Hall of Fame in ceremonies on the SAU campus in Magnolia Tuesday night. Dr. Hart was among four area educators honored based upon nominations and recommendations to the SAU College of Education made through a university committee to the SAU Educational Leadership Program. Program Director Dr. Connie Wilson said in an overview of the evening that Hart’s selection was rooted in his relationship with students in the Hope Public Schools. Wilson said she saw that relationship in the way students readily approached him during a campus visit. “Dr. Hart; wow, what a connection to the students,” she said. Hart was invested as a Doctor of Education in Education Administration by Texas A&M University – Commerce in December, 2018. He obtained his superintendent’s certification from SAU in 2009, and he holds Bachelor of Science in Education and Master of Science in Education degrees from Henderson State University in Arkadelphia. Hart holds state certifications as a District Administrator, Secondary Principal, Secondary Physical Education Teacher, and Athletics Coach; and, he is a 1987 graduate of Bryant High School. Hart is in his seventh year as superintendent at Hope, after eight years as Genoa Central High School Principal in Texarkana. He began his career in public education at Clarendon High School as a teacher/coach in 1994, before becoming a graduate assistant in the athletics department at Henderson State. Hart taught, coached and served as athletic director at Van-Cove High School for three years, prior to teaching and coaching at Hampton High School, before returning to Clarendon as athletic director and head football coach in 1999. Hart was named athletic director and head football coach at Augusta High School in 2002, prior to becoming principal at Newport High School in 2003. Hart reflected upon his educational background while growing up in rural family life in his acceptance. He said that he was impressed with the value of education when his mother returned to the classroom to earn her GED in order to pursue nursing. He said he has attempted to impress upon his children that education is not merely a means to an end, but a valuable part of what shapes life. “I may be one of those who are better educated than their talent can carry,” he quipped. Active in community life in Hope, Hart has served as president of the Hope Rotary Club, and is a Rotary Paul Harris Fellow; has served on the board of the Hope/Hempstead County Chamber of Commerce; and, is a member and serves on the Stewardship Board of the First United Methodist Church in Hope. Hart’s educational associations include membership in the AAA Principal’s Association, NASSP, AAEA, Union Pacific Principal’s Partnership, ASCD, Arkansas Association of Educational Administrators, Arkansas Academy for Educational Equity Advisory Board, and Arkansas Public School Rescource Center Advisory Board. He has also completed Master Principal Phase 1, Breaking Ranks II: Trainer of Trainers, and Framework for Understanding Poverty Trainer professional development. Dr. Pfeffer said the honorees were “transformers” rather than “bench warmers” who are helping to push public education in Arkansas forward. “Your leadership matters,” she said.